For various reasons – a brief illness and a work assignment that kept me anchored to the computer for about ten days – I’ve spent less time on the Argentine side of Patagonia than I had hoped or anticipated. That said, it’s still given me some insight into the continuing complications of the exchange rates here, both for foreign visitors and for Argentines and their businesses. Two weeks ago, I crossed the border from Chile’s Torres del Paine to the Argentine tourist town of El Calafate, where I usually stay in my cousin’s house. She was out of town, though, and my other usual contacts (her ex-husband and my nephew) had no available space, so I had to spend money on a hotel. 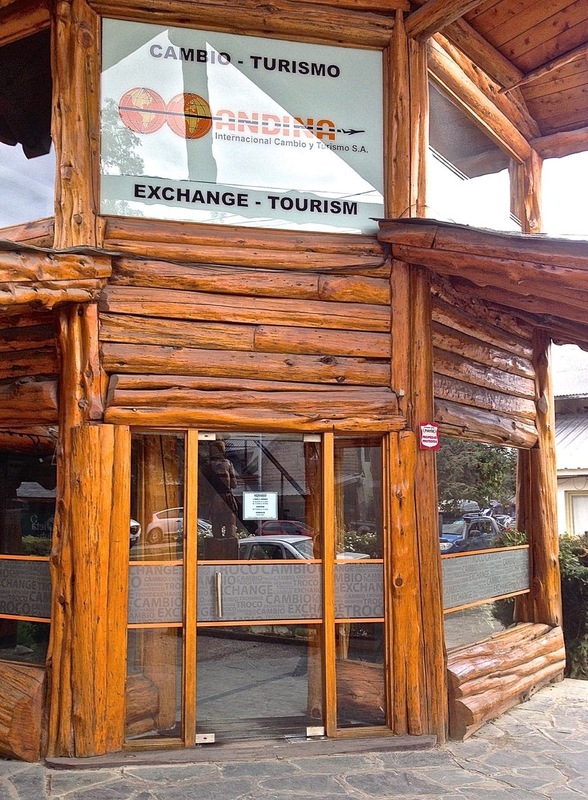 I found a simple but pleasant place for 490 pesos (about US$55 at the official exchange rate). I had a supply of Argentine pesos that I had purchased at the “blue” rate of roughly 13 to the dollar in December in Buenos Aires, but thought I might need more, so I asked the owner what rate she paid for US dollars. 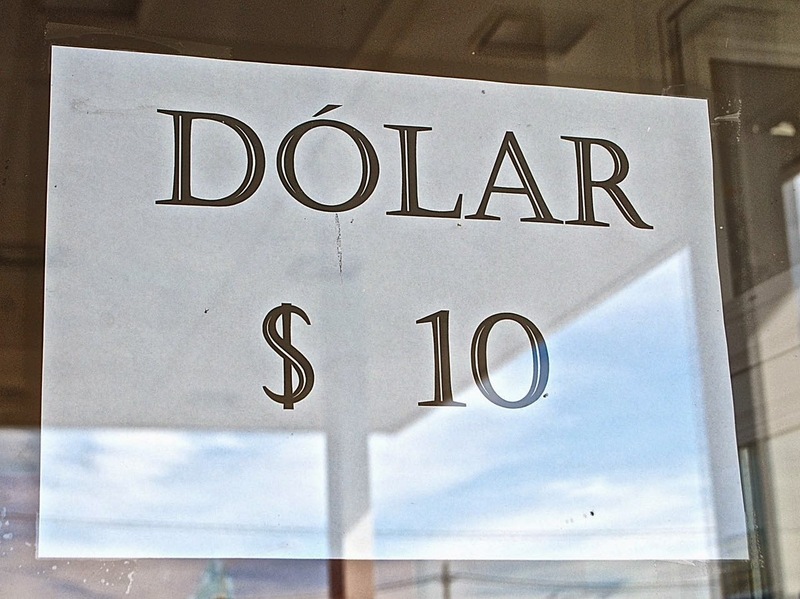 I knew it would be lower here, where the tourist economy puts quite a bit of foreign currency in private hands – my cousin and nephew are guides who often get tips in dollars – but accepted the offer of 11.50 pesos per dollar, which made the effective room rate about US$43. I also got some change in return, augmenting my peso supply. That wasn’t as good as the Buenos Aires rate and, at dinner with my nephew and my cousin’s ex that night, I learned that Calafate’s only foreign exchange house had closed. That leaves the banks and ATMs, which pay only the official rate, or negotiations with hotels or other businesses, such as tour agencies. 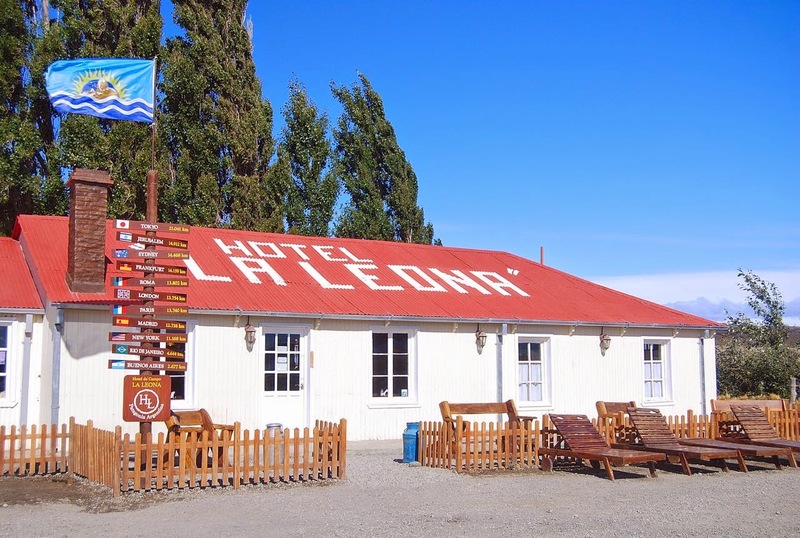 En route to El Chaltén, I made a brief stop at the historic roadhouse of La Leona (pictured above), where the rate was 11 pesos (as pictured below). 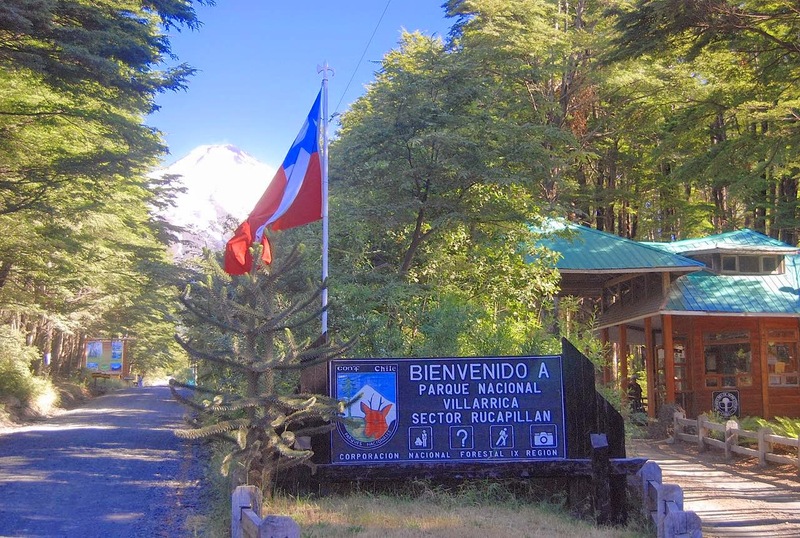 Friends at El Chaltén, who operate a hybrid hostel/B&B, told me they were reluctant to involve themselves in money-changing because of the recent fluctuations in the market (the dollar reached as high as 15 pesos in the not-too-distant past). As I reported in the previous post, I had to make an unexpected detour to the town of Gobernador Gregores as I drove north on Ruta 40, and there the YPF gas station (pictured below) was offering 10 pesos – not much of a premium on the official rate. I had plenty of pesos to fill the tank, though, so I didn’t have to change money there. Shortly thereafter, I returned to Chile and, a couple days ago, I crossed the border from Futaleufú to Esquel, where a friend told me the market there had pretty much dried up because of a government crackdown. 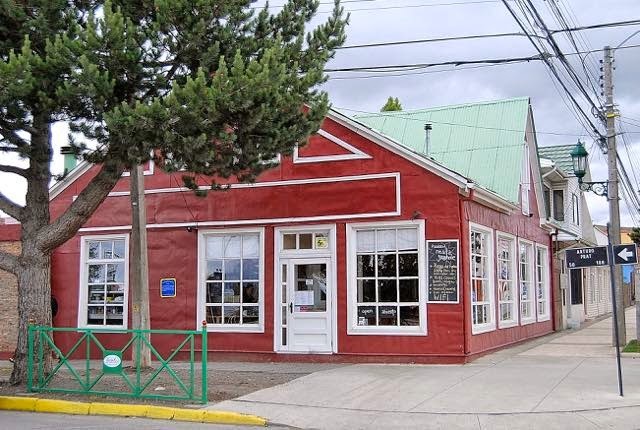 I proceeded north, with a brief stop for empanadas and ice cream at El Bolsón, before arriving at Villa La Angostura, my last stop before returning to Chile. My pesos were running a little low. 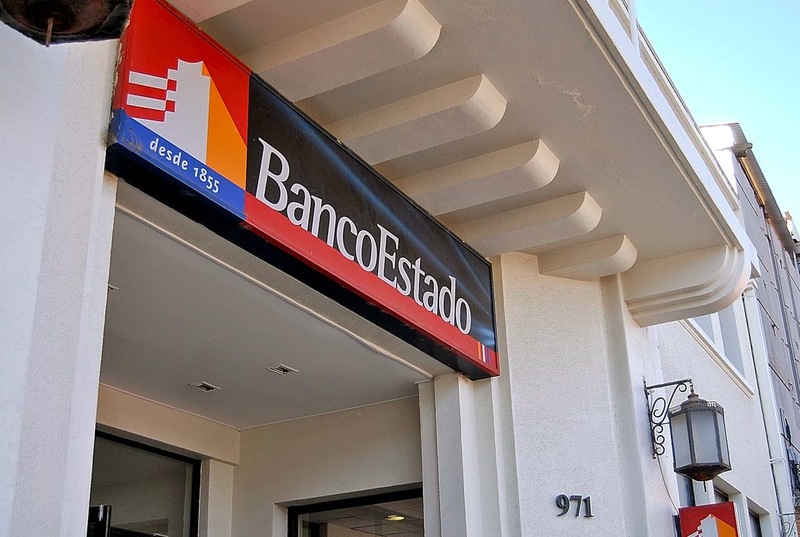 Unfortunately, I arrived too late to visit Cambio Andina (pictured at top), an exchange house that was paying the blue rate last year. I went to find accommodations and learned that, unfortunately, this is the weekend of a big moto-cross event (something I loathe) and rooms would be hard to find. The first place that had a room (which I knew from an earlier visit) would accept dollars at nine pesos, barely above the official rate. Another place’s prices had skyrocketed – even in dollar terms – since I stayed there last year, but its owner would change dollars at 12 pesos. I decided to try one other place, where an apologetic receptionist told me that Andina would still change at the blue rate for tourists, but only the official rate for locals, so she preferred not to do so. I ended up returning to the previous option, but paying a bit more than I had hoped. What’s the moral of this story? Argentina continues to be unpredictable, and is likely to be so at least until a new government takes office at year’s end. There’s also news in Chile’s foreign exchange market, where the dollar stood at roughly 620 pesos when I arrived at the end of January, then rose upwards of 640 before recently returning to the 620 level. This contrasts, however, with the rate of 540 pesos a year ago, so that Chile has actually gotten a bit cheaper (unlike in Argentina, inflation remains low). 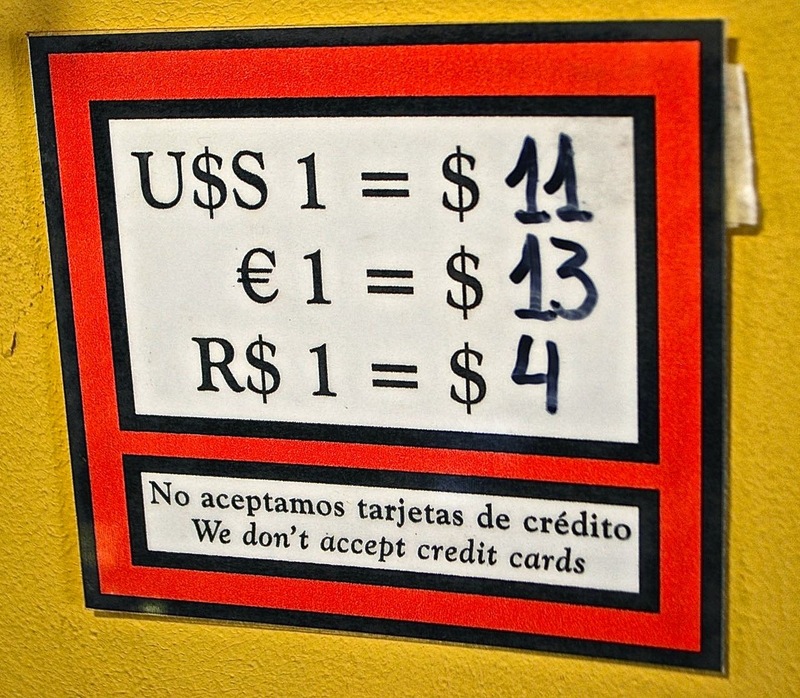 Also, in Chile, there’s no parallel market, so you can withdraw from ATMs without an exchange rate penalty (preferably BancoEstado, with very low user charges). When I first drove the Santa Cruz province segment of Argentina’s Ruta 40, in 1991, it was all gravel. In four days, my wife, a friend and I saw three other vehicles between El Calafate and the town of Perito Moreno. 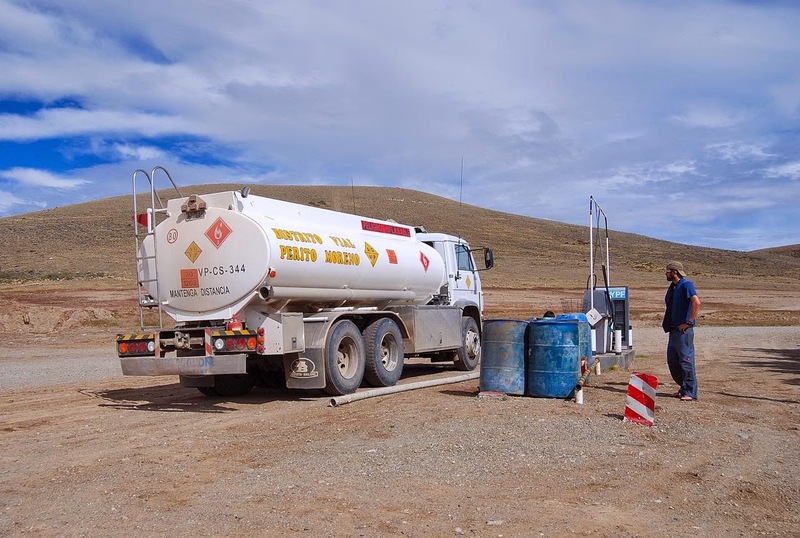 I vaguely recall we bought some gasoline from an estancia just outside Parque Nacional Perito Moreno, but – perhaps naively – we never worried about running out of fuel. Today this segment of Ruta 40 is almost completely paved and one might expect that, over the ensuing decades, energy infrastructure would be even more reliable. If so, one would be wrong - having driven the route at least another ten times since then, I have always warned drivers to fill the tank at every opportunity and, even then, carry extra fuel. So what happened when I failed to follow my own advice? 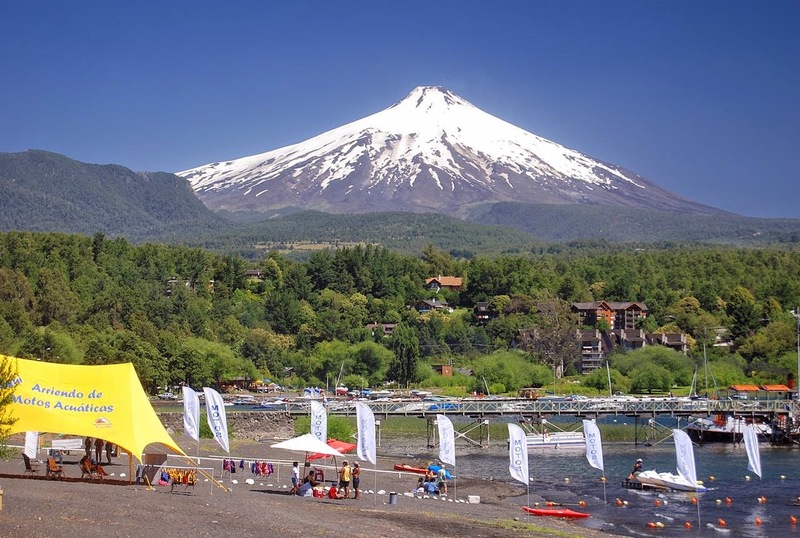 Tuesday morning, I left the town of El Chaltén – Argentina’s self-proclaimed “trekking capital” – with the idea of reaching the town of Cochrane, on Chile’s Carretera Austral – that night. My route would resemble the one I drove in 1991, except for the start and finish points, but the distance would still be comparable. Leaving El Chaltén, I had more than half a tank of gas and a 20-liter can, so I satisfied myself with photographing YPF’s new, solar-powered container station (pictured at top) on the outskirts of town. I figured to fill the tank at Tres Lagos (pictured immediately above, the last supply in 360 km, where I had always found plenty of fuel on previous trips. 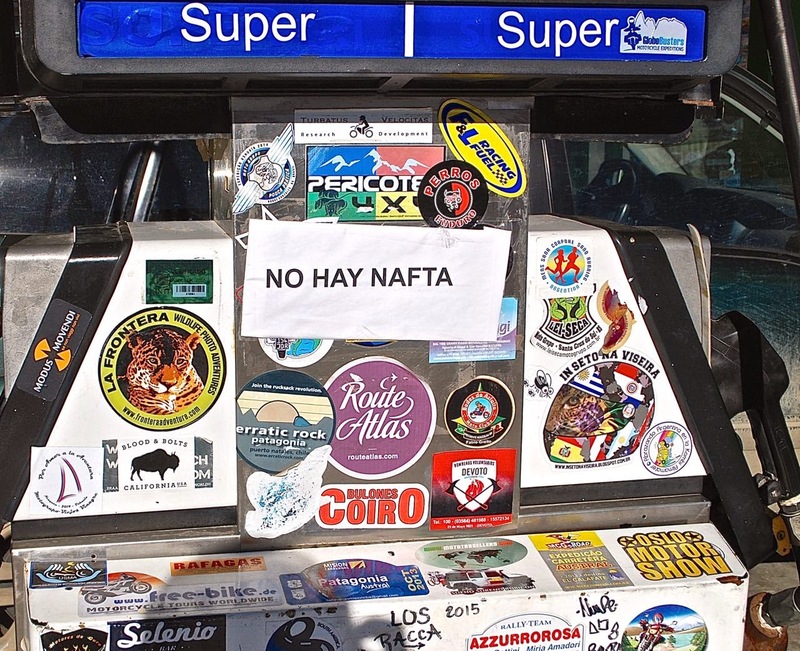 I should not have done so because, when I got there, the pumps said “no hay nafta” (no gasoline), though there was diesel. That was a problem because, even though I had enough fuel to reach the next stop at Bajo Caracoles – where I would turn west toward Chile – that remote station was notorious for running out of gasoline, to the point that, in the recent past, some motorists might wait days for the supply tanker to arrive. Given that reality, I had to divert to the more reliable option of Gobernador Gregores, which involved at least an additional hour’s driving. When I finally got to Bajo Caracoles (pictured above, from an earlier trip), there was fuel but I had no way of knowing that in advance. It was also getting late in the afternoon, and I had to decide whether to tackle the rugged westbound road toward Cochrane (where the border would soon close) or follow the paved road north to Perito Moreno and then west to the border towns of Los Antiguos (Argentina) and Chile Chico (Chile). Reluctantly, I decided on the latter and took advantage of the changed route to pay a brief visit to an ailing and elderly friend in Perito Moreno. I then continued to Los Antiguos only to discover that there was no gasoline on the Argentine side, where the price is about half what it is in Chile. If I had only filled up in Perito, 53 km east, I would have saved a significant chunk of change. 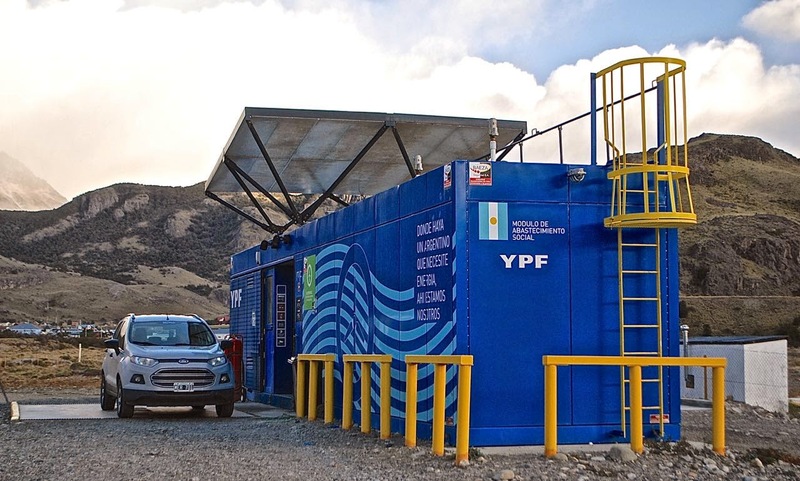 Interestingly, there are two significant slogans on the side of the YPF container at El Chaltén. The shorter one translates as "Social Supply Module," while the longer one says "Wherever an Argentine needs energy, we're there." Of course, I'm not an Argentine, so maybe I don't count - but the car that pulled up behind me at Tres Lagos was. The moral of this story could be that, if you don’t follow your own advice, you get what you deserve. 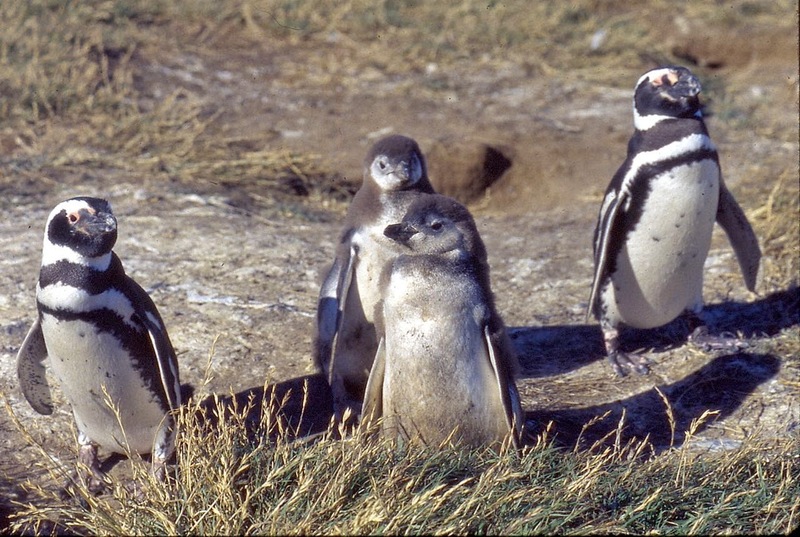 Almost everybody who visits Patagonia hopes to see penguins. 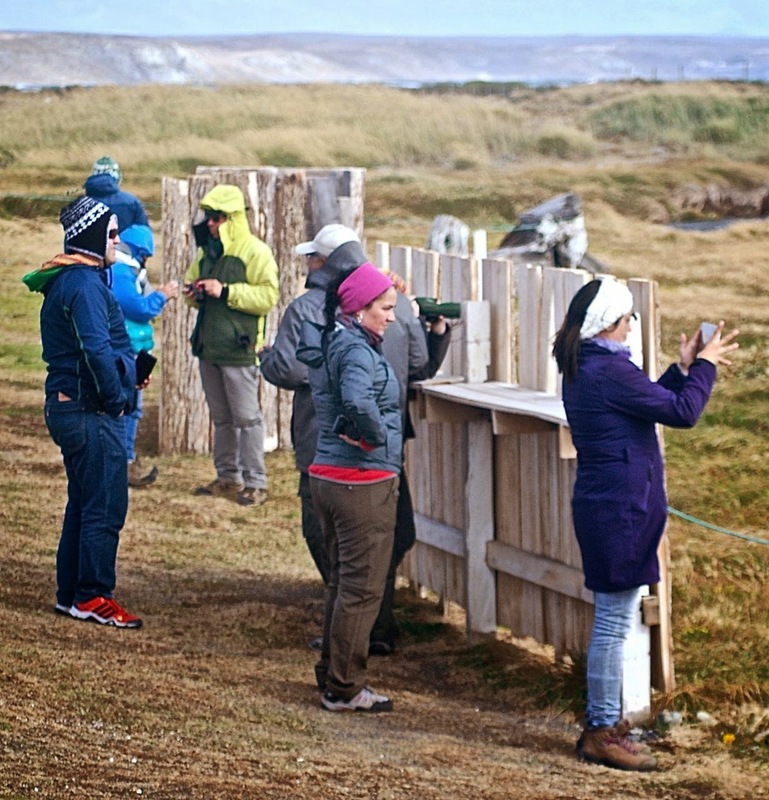 Every once in a while, passengers on the Navimag ferry from Puerto Montt to Puerto Natales will spot one in the water, but most visitors prefer close-ups at nesting sites like Otway Sound or Isla Magdalena (pictured above), near the city of Punta Arenas. There, from October to March, Magellanic penguins and their newborn chicks (pictured below) become the subjects of countless photographs. There’s a new option and even more interesting option, though. 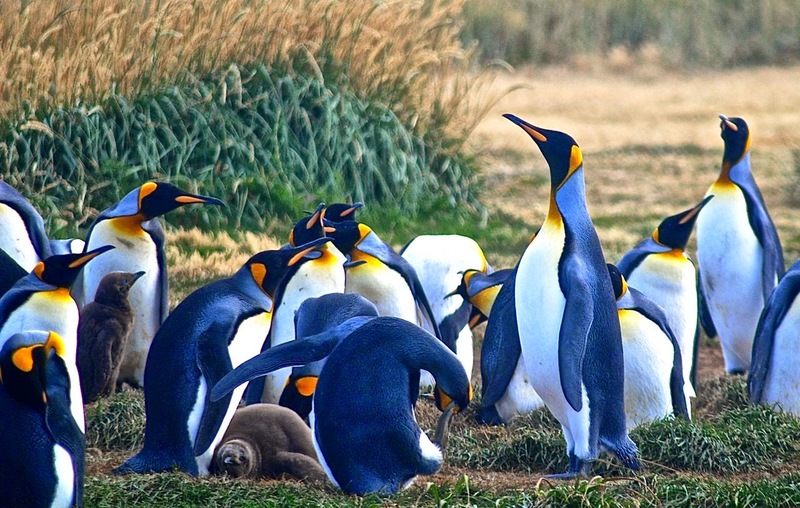 Since 2009, a swarm of colorful king penguins has begun to colonize a site at Bahía Inútil (“Useless Bay”), across the Strait of Magellan on the Chilean side of Tierra del Fuego. These resemble the giant emperor penguins that paraded across the Antarctic in “March of the Penguins,” but they are somewhat smaller and lead a less arduous life, though they still forage hundreds of miles in search of food for their chicks. 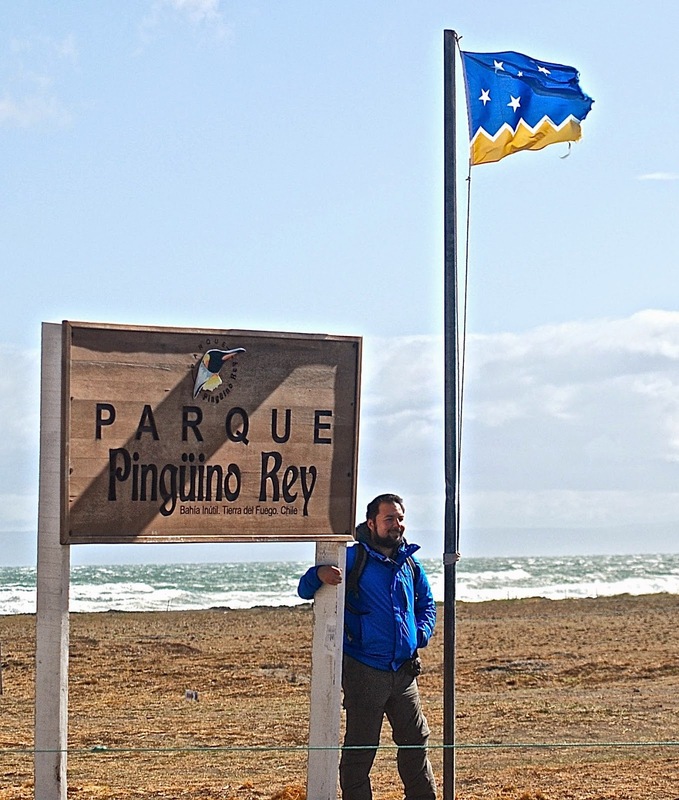 Getting to the king penguin colony, which is now a private nature reserve called Parque Pingüino Rey, is a bigger time commitment than the Magellanic colonies, one of which is barely an hour from Punta Arenas. It requires a two-hour ferry ride to the town of Porvenir and another two hours overland to reach Bahía Inútil, and a return to the continent via the more northerly crossing at Primera Angostura. That, in effect, makes it a full-day excursion to spend about an hour or so with the kings, which I did recently with a local tour company. 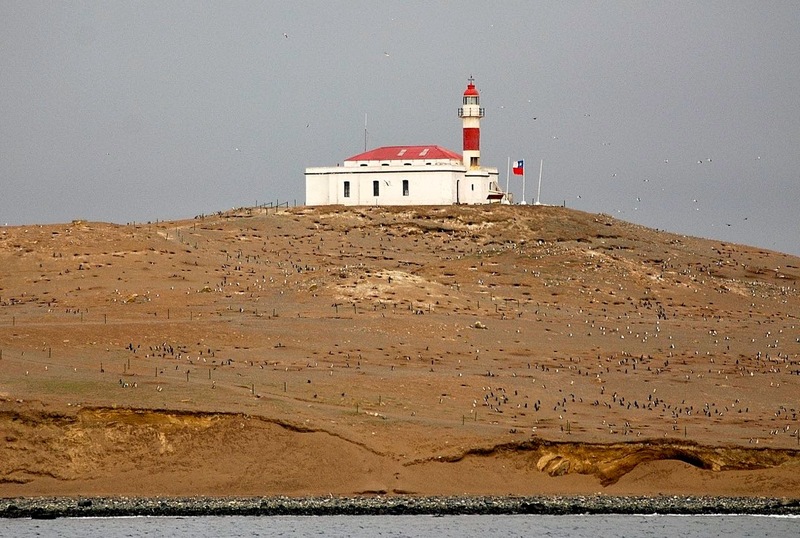 Another advantage to the trip is that some birds stay at Bahía Inútil all year, though the size of the colony varies. It’s been as large at 150, though there were about 75 when I went in mid-March. Wooden blinds keep human visitors from approaching too closely, but also offer protection from strong winds. While I have my own car here, I was pleased I didn’t drive. In the first instance, the freight for the vehicle would have cost me nearly as much as the excursion did. 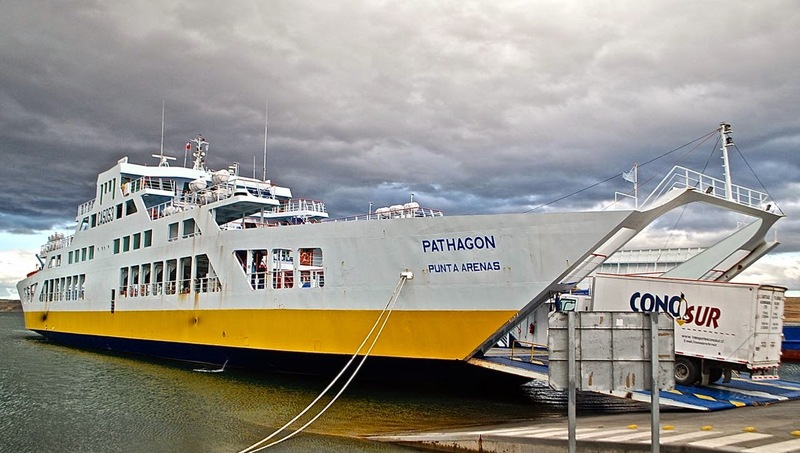 In the second instance, I probably would have driven north to the Primera Angostura crossing where, as it turned out, high winds had shut down the ferry shuttle with the continent and left an eight-km line of vehicles waiting to board without knowing when the service might resume. Because of this, the driver told us, we could return to Punta Arenas via Porvenir, where the ferry Pathagon’s departure had been delayed, instead of going to Primera Angostura. This, however, required unanimous consent from all 17 of us, since the tour included a visit to the company town of Cerro Sombrero before returning via the northern crossing. All the Spanish speakers agreed, and I had to interpret for the English-speakers, including three Taiwanese whose fluency was not completely clear. 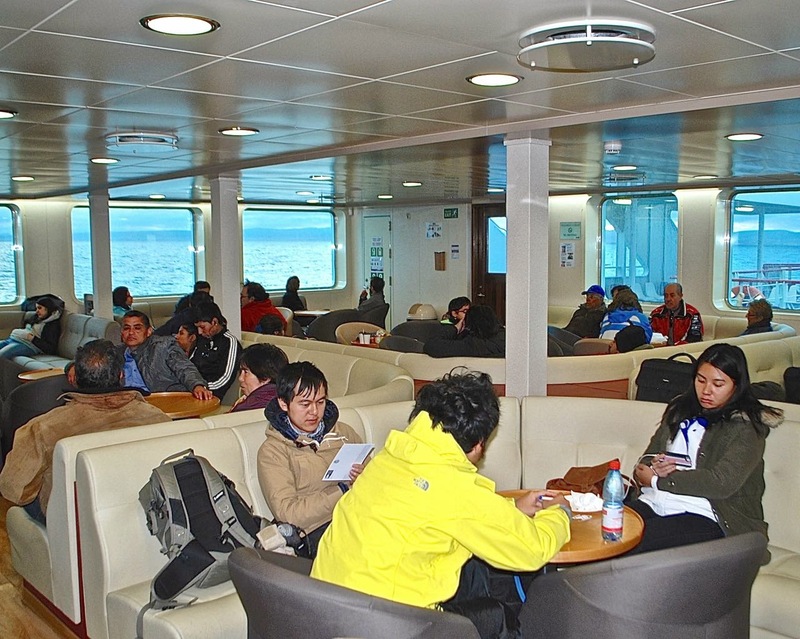 Not making the ferry would have complicated matters, as Porvenir (population 6,000) and Sombrero (about 700) are the only towns on the Chilean side of the island, and have very limited accommodation. Fortunately, the large and comfortable Pathagon (pictured above and below, it's literally a huge improvement on its predecessors) could handle the wider section of the Strait easily, and we returned by 9 p.m., in time for dinner. Nobody who saw the kings, though, was disappointed after the long day. 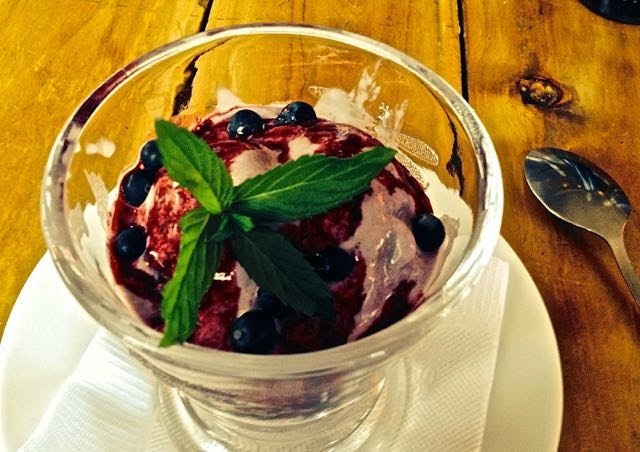 According to a popular saying in Patagonia, "Whoever tastes the wild calafate berry returns" for more. In my case, that’s long been true, but maybe we can invert the saying: “The calafate berry itself may return to whoever tastes it,” as I experienced the other day in Puerto Natales. 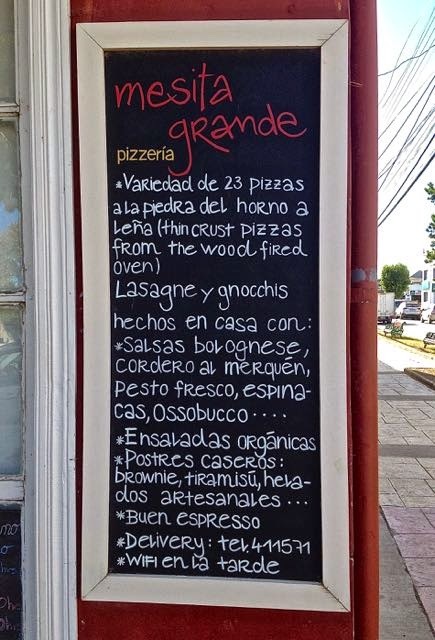 Recently, while having lunch in Natales’s outstanding Mesita Grande pizzeria (pictured above), I noticed an unusual item on the chalkboard menu: yerba mate ice cream, which I had seen only a few times in Argentina and never before in Chile. I ordered it with a scoop of chocolate, both of which were excellent – by far the best ice cream in town. It was something that fell into the “pleasant surprise” category. Returning a few days later, I asked for it again and learned that the manager Laura Rosenberg, with whom I spoke, was an Argentine who formerly worked for the luxury Explora hotel in Torres del Paine. As it happened, she knew Helados Jauja, one of my own favorite Argentine ice creameries, and I mentioned Jauja’s exquisite calafate con leche de oveja (calafate berries with sheep’s milk), a seasonal flavor produced in El Bolsón that occasionally makes it north to Buenos Aires (Jauja has a locale one short block from my Palermo apartment). I only intended to mention that in passing, but she took me seriously and, the next day, she went in search of sheep’s milk, which she found at the Universidad de Magallanes's experimental creamery, where they also made cheese with basil and the Mapuche spice merquén. She also informed me, though, that it was harder to find fresh calafate berries. Nevertheless, she sent me an email on Friday that an experimental version of the ice cream (pictured below) would be ready if I cared to taste and review it. That evening I did so, and made the following critique: 1) I liked the taste, but it was a little too sweet, and would be better with less sugar; 2) I prefer a firmer texture like the yerba mate flavor; this one was softer than I like. She attributed the texture issue to the fact that she couldn’t find fresh berries on short notice, and had to settle for a prepared syrup instead. In the context that this was an experiment not quite ready for prime time, though, I was satisfied, and I look forward to an improved version on my next visit to Natales – where the calafate came to me, rather than my having to go to it.